With security becoming an increasingly apparent challenge for IoT developers, Maxim has put together a reference design for its security co-processor that uses an Arduino-compatible interface and the ARM mbed development libraries. The rapid growth of IoT capabilities for industrial applications comes with legitimate concerns about data integrity, due to deliberate corruption of critical sensor data anywhere between a source and the cloud. The reference design’s architecture and components, Arduino-compatible hardware interface, and mbed libraries support simplifies development of secure, uncorrupted, and authenticated sensor-to-web data. It is aimed at analogue sensor nodes and data authentication in factory automation and industrial processing applications. The reference design’s two-stage hierarchical architecture consists of a shield that communicates to a web server, and a protected sensor node for data acquisition and authentication. The shield includes a Wi-Fi module; a DS2465 secure coprocessor for offloading SHA-256 cryptographic computation; 1-Wire and I²C interfaces; user-interface LCD, LEDs, and pushbuttons; along with alarm and logging functions. The sensor node contains a DS28E15 secure authenticator, DS7505 temperature sensor, and MAX44009 light sensor. The reference design is built to protect an industrial sensing node by means of authentication and notification to a web server. 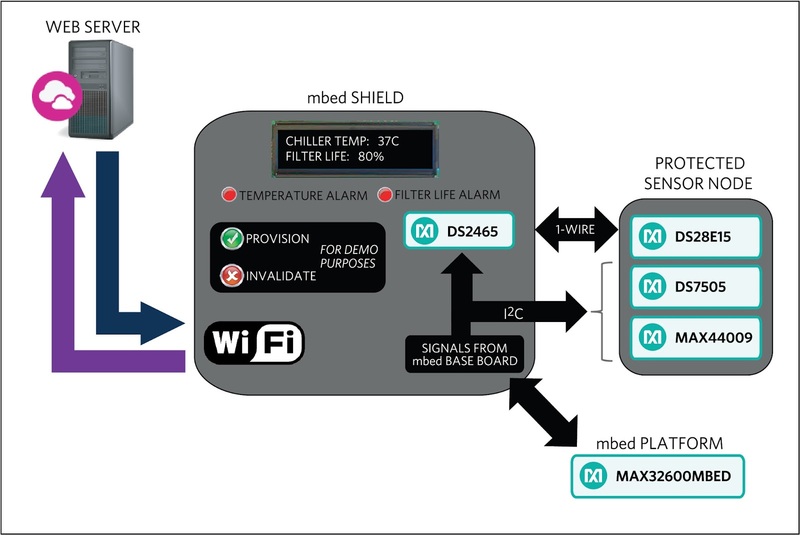 The hardware includes a peripheral module representing a protected sensor node monitoring operating temperature and remaining life of a filter (simulated through ambient light sensing) and an mbed shield representing a controller node responsible for monitoring one or more sensor nodes. The design is hierarchical with each controller node communicating data from connected sensor nodes to a web server that maintains a centralized log and dispatches notifications as necessary. The mbed shield contains a Wi-Fi module, a DS2465 coprocessor with 1-Wire master function, an LCD, LEDs, and pushbuttons. The protected sensor node contains a DS28E15 authenticator, a DS7505 temperature sensor, and a MAX44009 light sensor. 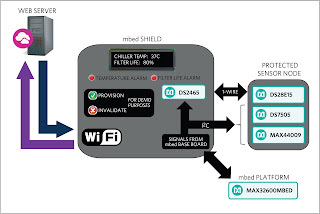 The mbed shield communicates to a web server by the onboard Wi-Fi module and to the protected sensor node with I2C and 1-Wire. The MAXREFDES143# is equipped with a standard shield connector for immediate testing using an mbed board such as the MAX32600MBED#. The simplicity of this design enables rapid integration into any star-topology IoT network requiring the heightened security with low overhead provided by the SHA-256 symmetric-key algorithm. Design files including schematic, PCB files, and bill of materials (BOM) can be downloaded from the Design Resources tab. By looking across all the different technologies and markets in the embedded space, this blog pulls together trends and opportunities through exclusive news, video and comment that you might not have seen from sites dedicated to individual topic areas. The labels below allow you to select your own interest areas, and please look through the archive. The Embedded Blog is one of the services from Flaherty Publishing Ltd, which include SouthWest Innovation News and the High Tech news channel at TechSpark.co covering news from the tech hotspot in the southwest UK, editorial and marketing services, the High Tech Sector group of the West of England Local Enterprise Partnership, media training specifically for tech companies and Bristol-based tech startup enchantd.